Several international airlines on Wednesday halted flights to Israel indefinitely, citing security concerns as high-level diplomatic efforts failed to yield any result to end the 16-day conflict that has killed 640 Palestinians and 31 Israelis. Delta was the first carrier to halt flights to and from Israel after diverting a flight carrying 273 passengers bound for Ben Gurion airport to Paris after a rocket from Hamas- controlled Gaza Strip landed near Israel’s biggest airport. It was followed by America’s Federal Aviation Administration -- which has halted all US flights to and from Israel -- Air France and Dutch airline KLM. The decision is likely to deliver a substantial blow to Israel’s tourism industry, the one sector that has already suffered during the conflict. The death toll mounted as neither side showed any sign of backing down. 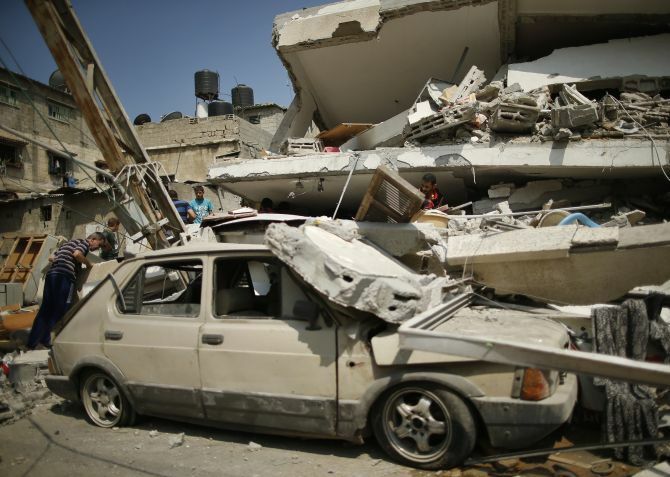 Palestinian health officials said at least 640 Palestinians had been killed and 4,040 wounded. Some 70 to 80 per cent of them are civilians, according to the UN. Twenty-nine Israeli soldiers and two Israeli civilians were also killed in the conflict. Image: Smoke is seen after an Israeli strike over the Gaza Strip July 22, 2014. 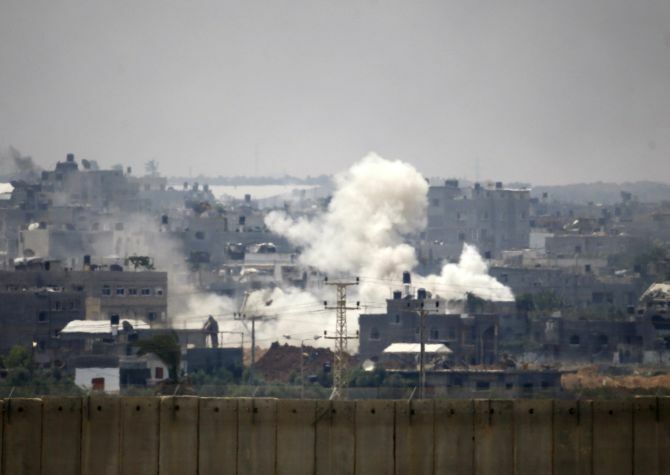 Israel pounded targets across the Gaza Strip. United Nations Relief and Works Agency said more than 1,18,300 Palestinians have now taken refuge in its shelters. It says 43 per cent of Gaza has been affected by evacuation warnings or declared no-go zones. On US President Barack Obama’s direction, US Secretary of State John Kerry on Tuesday held talks with Egyptian and Arab League officials in Cairo to push for an “immediate cessation of hostilities”. In Jerusalem, UN Secretary-General Ban Ki-moon met Israeli Prime Minister Benjamin Netanyahu, who showed him a collection of rockets that had been fired into his country. Ban called the evidence “quite shocking” and called for an immediate end to the attacks. highly sensitive moment”. “Suffice it to say, it is my hope and belief that these talks will lead to results and an end to the fighting in the very near future,” he said. Image: Palestinians inspect a residential building, which police said was destoyed in an Israeli air strike, in Gaza City.